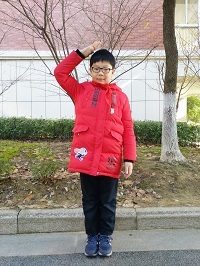 Hello,everyone!My name’s Tong Zhe.I come from Class 4 ,Grade 4.My favourite colour is blue.I can play basketball and football,and I also can run.I like reading best,because reading can help us make much progress.I hope everyone will like reading books like me.Thank you very much! 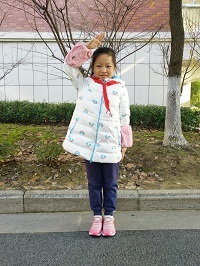 Good morning,dear teachers and classmates!I’m Jiang Shu.I’m in Class 4,Grade 4.I’m ten years old.Today ,I;m very excited to stand here.Thanks for giving me the chance to be a flag raiser.I like singing、dancing、playing the piano and making friends.would you like to make friends with me? 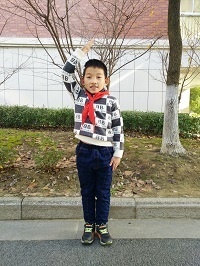 Hello,everyone!My name is Zhu Qiwang.I’m a student from Class 4,Grade 4.I’m very luck to be here.I think English is very interesting.I do English homework,watch English films and do some reading everyday.Thanks for your listening.